Admission procedure in almost all the universities is going to start in the month of June. Many universities have declared results where as many universities are et to declare. Students are eagerly waiting for their results so that they can fill-up the application form for the university in which they want to take admission. 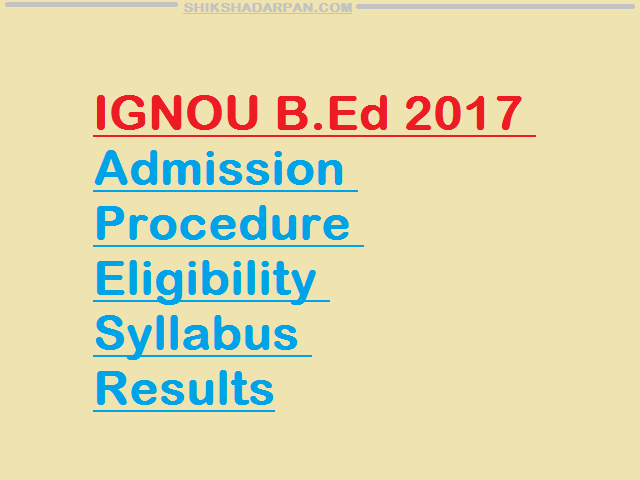 Today we are going to see the details regarding IGNOU B.Ed 2018 Admission Procedure. There are many ways in which you can apply which includes online and offline procedure. In both the common thing is you need to fill-up the application form. This is mandatory. IGNOU stands for Indra Gandhi National Open University which was established in 1985. Providing various courses, IGNOU is a university which conducted entrance examination twice in a year in order to give admission to eligible courses in various courses. If a student want admission in their field of interest then they need to crack the cut-off score and make their place in the merit list. Talking about IGNOU B.ED 2018 Admission Procedure, it is a 2 years course. The entrance examination for the same was conducted and soon the result will be declared. The date for result is not declared, it will be updated soon. The last date of submission of the application form is in the month of May 2017. Need t fill-up fast. Students from many states apply in this university. For taking admission in IGNOU B.ed course, there is a eligibility criteria. If you are eligible then you will easily get admission. Let us see what is the eligibility criteria for this. If you are already pursuing any bachelor’s or master’s degree then it is mandatory that a candidate must pass it with minimum 50%. If you are doing bachelor’s in science or mathematics that 55% is mandatory for being eligible. Any candidate who is already pursuing any bachelor’s degree can apply for admission in this university. A candidate can pay the fees of amount 20,000 only through Demand Draft while taking admission in B.ED in IGNOU University. On the back side of demand draft kindly write your name and course name in CAPITAL LETTERS. The entrance examination is going to be conducted in the month of August 2018. The exact date is yet to be announced. Candidates can collect their Hall ticket just before 10 days of their examination. The syllabus of B.ED in IGNOU university is quite good. It is divided into four different groups. Let us see what each group contains. ⇒Psychology of Learning and Development. As the exam is going to be conducted in August, the result will be declared in 1-2 months after exam. The date is not announced. We wish Best Of Luck to all the candidates who are going to appear in IGNOU B.ED Exam.